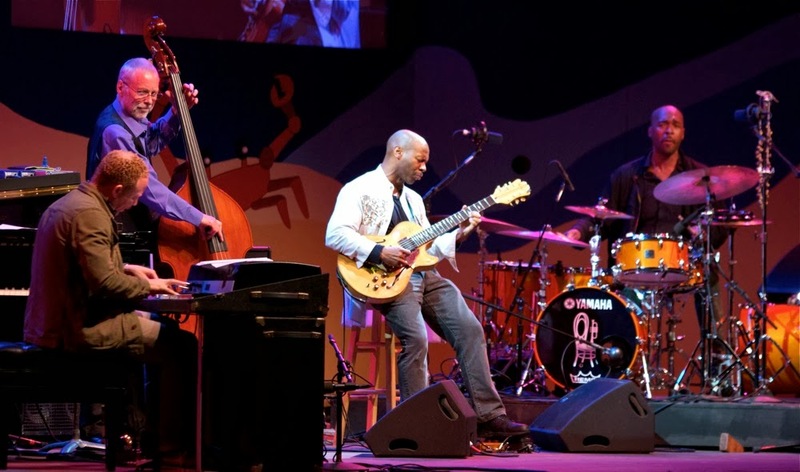 Our Saturday at the 56th Annual Monterey Jazz Festival began in late afternoon, after all the stages had opened and some were hosting their second concerts of the day. The sounds of Big Sam's Funky Nation met us at the gate, and we headed for our Saturday ritual, a tradition for many festival-goers: the annual DownBeat Blindfold Test. Jazz journalist and author Dan Ouellette (whose new biography of Bruce Lundvall, "Playing by Ear," is forthcoming) did his best to stump Joe Lovano, a genial man with an encyclopedic knowledge of jazz. In among guessing the saxophonists on recordings Ouellette had chosen, Lovano shared stories of people he had known, admired, and worked with. He told us what Steve Lacy had once told him: "I don't want to make a record that sells a million copies. I want to make a million records and sell one copy of each." After he had correctly identified Chris Potter as the overdubbed soloist on a recording no one in the room had ever heard, Ouellette asked, "How did you come up with Chris Potter?" Lovano replied, a bit testily, "I wasn't guessing." 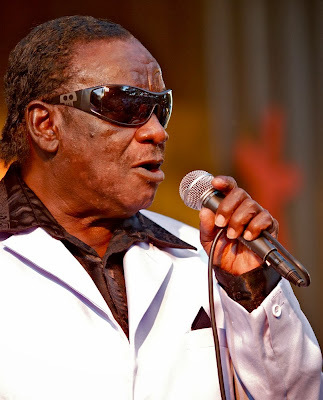 The Relatives -- Texas preachers and brothers who made their first recordings 30 years ago, then disappeared from sight, only to be rediscovered by a savvy producer -- were tearing up the Garden Stage. When we arrived, half the crowd were on their feet and most were dancing. The elderly gentlemen in white suits acted like teenagers on stage. The speakers were turned up so loud that when I got too close, my pants started shaking. "Try God!" the Relatives shouted. "Take the hand of the person standing next to you! Try God!" Many people in the audience knew the words to the old-time gospel songs the Relatives sang with blow-down-the-walls-of-Jericho force. Afterward, they went to the Amoeba tent to sign CDs. They're having the time of their lives, and they thought they were retired. Later that day on the Garden Stage, the bass player Charnett Moffett showed us, not for the first time, that the only instrument you really need is the bass, if you know how to use it. 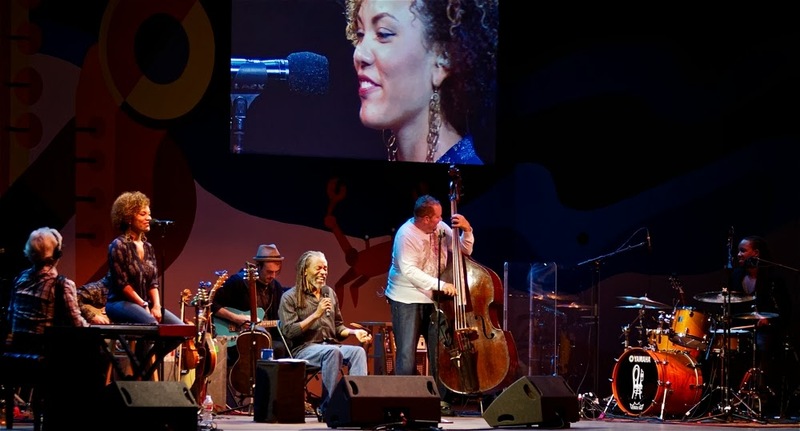 We heard "Eleanor Rigby," the melody as clear as if Paul McCartney were singing, and Wynton Marsalis's "Black Codes," and Mingus's "Haitian Fight Song," and Moffett's own "The Bridge," the title track from his new CD, and his Hendrix-infused "Star Spangled Banner." One of the most imaginative, technically adept, and physically expressive bassists on the planet, Moffett asked for and got audience participation on one tune. Who has ever suggested that a crowd sing along with a bass? 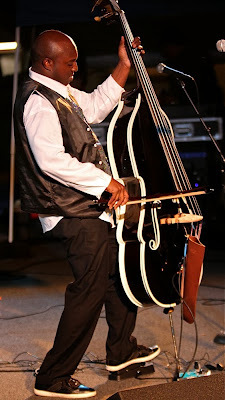 Moffett's bass is a wonder: ebony-black, with piped white details and edges, like frosting. 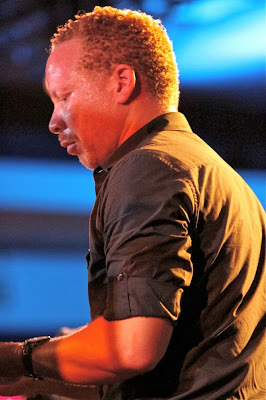 We raced to the Night Club for a few moments of our hometown hero Craig Taborn (he lives in New York now but grew up in Minneapolis) and his quartet, which includes another Minneapolis son, drummer Dave King, and New York imports Chris Lightcap on bass and Chris Speed on saxophone. (Along with playing in John Hollenbeck's band and leading several of his own, Speed is also a member of one of King's new-ish bands, the Dave King Trucking Company). Across the way at Dizzy's Den, a huge queue formed, hoping to get into Ravi Coltrane's quartet. There was a good crowd at the Night Club, but experimental, unpredictable jazz is not what most people come to Monterey to see. That's what Taborn delivers, often to his own band members. (As a sweaty Dave King said backstage after the set, "What did you think of that last tune? Craig called double-time on it. It was cantina music!") 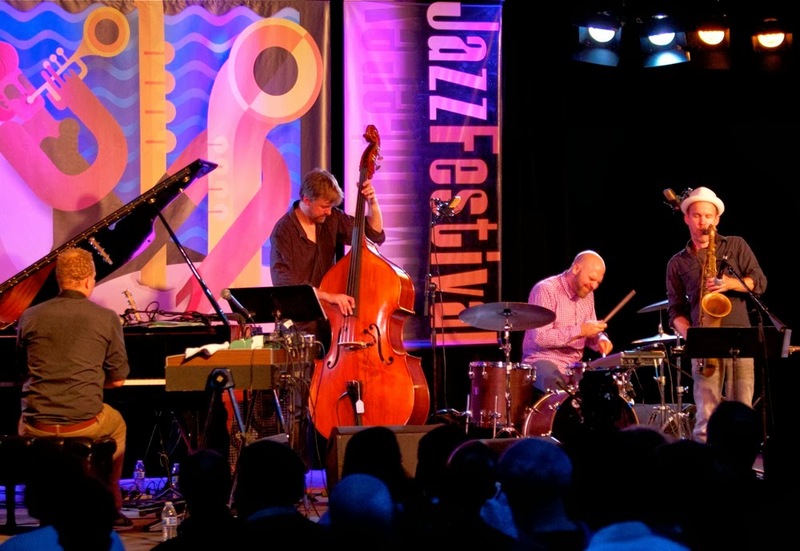 We heard demanding, adventuresome tunes, tricky time signatures and driving grooves. In the Arena, Joe Lovano and the Dave Douglas Quintet were premiering two Wayne Shorter compositions commissioned by the Festival, "To Sail Beyond the Sunset" and "Destination Unknown." We heard the closing moments, soaring and celebratory, and a solo by bassist Linda Oh that drew shouts from the crowd. 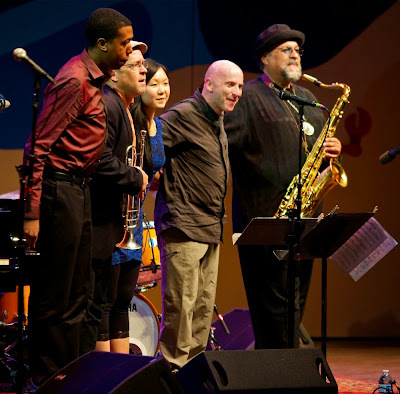 Tonight's quintet included Joey Baron on drums. 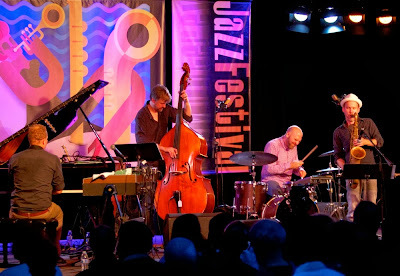 Up next in the Arena was one of the bands we looked forward most to seeing this year: Dave Holland's Prism, with Taborn (in his second gig of the night) on Fender Rhodes, Kevin Eubanks on guitar, and Eric Harland on drums. A supergroup and a true collaboration -- all the members compose for it -- Prism just released its self-titled debut album on Holland's label, Dare2. (If you've ever wondered why Holland left ECM after thirty years to strike out on his own, Prism is a clue.) 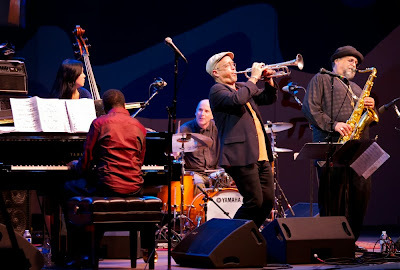 Prism reaches back to Holland's Electric Miles days of the late 1960s, travels through the intervening years of Holland's genius at putting bands together, reunites Holland with Eubanks (they last recorded together in 1988; "Extensions," with Steve Coleman and Marvin "Smitty" Smith," was named DownBeat's Album of the Year), and adds two spectacular younger players, the restlessly experimental and brainiac Taborn and the powerful and sensitive Harland, who is also a member of Charles Lloyd's quartet. 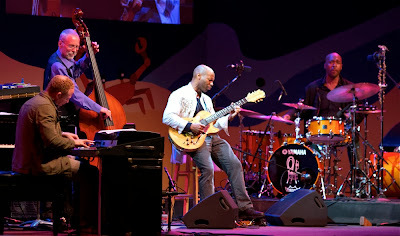 It was a tremendously exciting set by a searing, sometimes screaming band, with Eubanks' guitar front and center. A Festival high point. 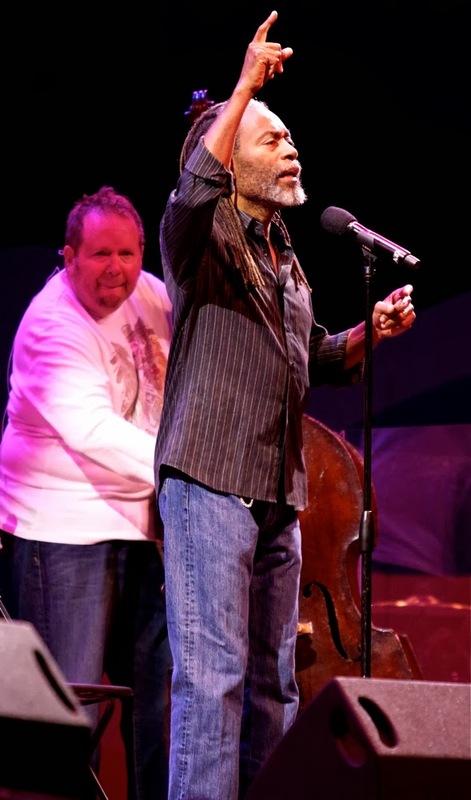 The night ended in the Arena with Bobby McFerrin's latest project, "Spirityouall." Every McFerrin performance is a spiritual experience; this was just more literal and direct than most. Joined onstage by six people including his daughter (and Berklee student) Maddy on background vocals, McFerrin led the rapt crowd on a profound and joyous journey through gospel songs, "Wipeout," the Twist, an exquisitely moving cover of Bob Dylan's "I Shall Be Released," "Whole World" with alternating pronouns ("He's got the whole world in his hands .. She's got you and me, brother, in her hands"), and a front-porch-in-the-holler "25:15" (from Psalm 25, verse 15: "My eyes are ever on the Lord, for only He will release my feet from the snares"). Someone behind us said, "I had no idea what this guy does. This is awesome." 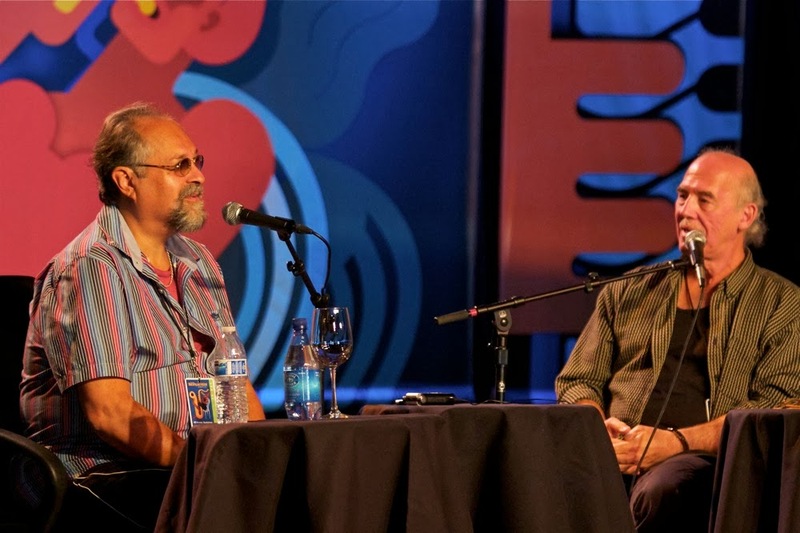 It was all so sincere and heartfelt, so relaxed and easy; McFerrin in jeans and a casual shirt, his gray dreads loose, going where the spirit led. At the end, he sent us off into the night with these words: "Promise me now: at least one Hallelujah a day."